In today’s cloud-computing world, the Azure Virtual Machines (VM) are becoming more popular among IT infrastructures. Microsoft Azure is one of the leading cloud providers that offer various kinds of cloud-based services to bring an integrated solution platform. Azure Virtual Machines are one of the on-demand computing resources that come under Infrastructure as a Service (Iaas) category in Azure. Azure services are mainly used to build and develop cloud-based solutions in various organizations. Azure VM has acquired great importance in the midst of enterprises for its virtualization technology and the benefits offered by it. Go through this compact Azure Virtual Machine tutorial to gain knowledge about Azure VMs. 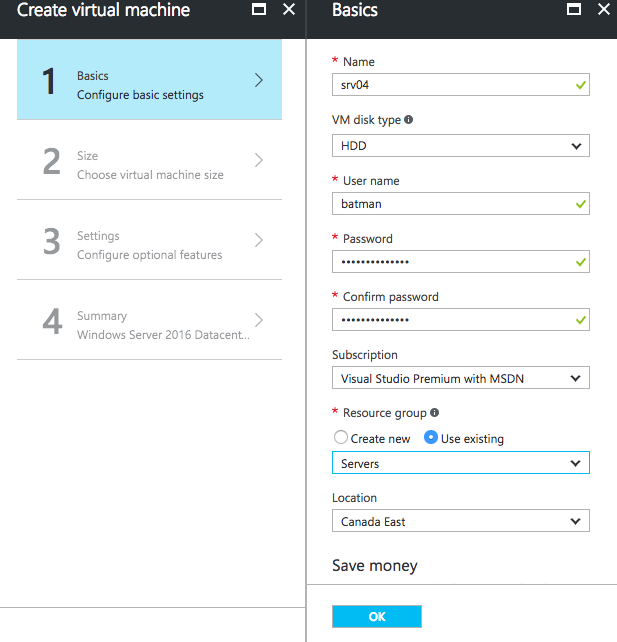 What is Azure Virtual Machine? What are the types of Azure Virtual Machines? What is Virtual Network in Azure? Windows Virtual Machine on the Azure Portal? Microsoft Azure is a well-known cloud computing service which was developed by Microsoft in the year of 2006. They are widely used to build, test, deploy, and manage application, and service through Microsoft-managed data centers. The Microsoft Azure is offering Software as a Service (SaaS), Platform as a Service (PaaS), and Infrastructure as a Service (IaaS). It is capable of supporting different programming languages, tools, and frameworks of both Microsoft basis and their party software. Get ahead in your career by learning Microsoft Azure through Mindmajix Microsoft Azure Training. There are two deployment models available in Microsoft Azure; one is classic deployment model and another one is Azure Resource Manager. Azure Resource Manager (Virtual Machine, SQL Database, etc.) is more famous as it enables the users to create a group of related services to deploy and maintain the resources together. Cloud computing is the process of providing computing services such as servers, database, storage, networking, software, and still more via the internet. The main benefit of making use of cloud computing services is that you have to pay only for what you use. It helps the organization to maintain the infrastructural needs efficiently at low operating costs. Cloud is classified into three categories; public cloud, private cloud, and hybrid cloud. The major applications of cloud services are developing new app and services, data analysis, delivering software on demand, test, and build applications, etc. Cloud computing is one of the blooming technologies in which you can store and access the data over the internet instead of storing it in the computer’s hard disk. In Cloud computing, data will be stored in a remote place and synchronized with other web information. Office 365 is a real-time example of Cloud computing in which MS Office Documents can be stored, edited, and accessed online without installing the program in the device. Nowadays, there is a plethora of cloud service platforms available to meet the demands of the organization. Microsoft Azure is one such cloud platform in which you can make use of Microsoft’s resource. It is similar to the cloud services offered at Google Cloud and Amazon Web Service. With the advanced tools and functionalities, Microsoft Azure is attaining a greater level in IT infrastructure. The common versions of Azure are Microsoft Azure v1 and Microsoft Azure v2. Microsoft Azure’s cloud platform is more beneficial for the organization to save time and money on the infrastructures. The major services offered by Microsoft Azure is computing, networking, storage, databases, data analytics, Internet of Things (IoT), developer tools, etc. Generally, Cloud computing is a model for authorizing convenient and on-demand network access to a shared pool of computing resources like servers, storage, applications, network, etc. These kinds of resources are provisioned and delivered with less management effort or service provider interaction. The cloud model consists of three service models, four deployment models, and five essential characteristics. In Software as a Service, the cloud providers offer the software or applications to their clients as per their requirements. The user can access this software on any of the devices that are connected to the internet. The clients who take the Platform as a Service acquires the ability to deploy the created application with the help of programming languages, tools and so on that are provided by the cloud provider. However, the customer cannot take control of underlying architecture like storage, servers, operating systems, etc. PaaS is highly beneficial for developers who need a platform to deploy their applications. In Infrastructure as a Service (IaaS) the cloud service provider delivers the customer with the virtual machine and other resources as a service. The cloud service provider abstracts the user from a physical machine, location, data partitioning and so on. For instance, if a user request Linux machine he can get the Linux machine without worrying about the physical machine or networking of operating system installed in it. These are the three cloud service models that are offered by cloud providers. Now, take a look into the four deployment models of the cloud. Private Cloud infrastructures are provisioned by a particular organization that consists of huge customers. The private cloud can be owned, managed and maintained by the organization, a third party or the combination of both. The data center architecture of private clouds is present within the firewall thus offering enhanced security. Hence, they are mainly used to store confidential data safely. Public clouds are one of the common deployment models of cloud service. Public cloud is a large data center which offers the same kind of service to all its customers. as the service is available for everyone they are widely used to reap its complete benefits in an enterprise. real time example of cloud service is Facebook, Google, and LinkedIn. A community cloud is the same as that of the private cloud that paves the way to maintain the benefits of private cloud. This is suitable for the customers who tend to face security, legislative issues, efficiency demands and more. In simple words, the community cloud is a closed private cloud that provides service to a group of users. Hybrid cloud can be defined as the combination of both public and private cloud. This kind of cloud services is utilized by large organizations. Hybrid cloud means that essential data are stored in a private cloud and its supporting services are maintained in the public cloud. The real-time examples of hybrid clouds are email, CRM, blogs and so on. On-Demand Self-Service: Cloud computing resources can be provisioned directly from the cloud service without human interaction. This resource may be storage space, virtual machine, database, and others. The organizations can make use of self-service web portals to access their cloud accounts. So, they can able to see the usage of services, provision and deprovision services. Broad Network Access: The cloud services are available over the network and they can be accessed through standard mechanisms of the customer platforms. It can also be defined as that cloud services are available over the internet and LAN in case of private clouds. Resource Pooling: Cloud computing resources are designed in such a way to support the multi-tenant model. Multi-tenancy enables multiple customers to share the same application or infrastructure even when privacy and security are maintained. The resource pooling characteristic of cloud computing means that different customers are serviced from the same physical resources. Rapid Elasticity and Scalability: Elasticity is the major characteristic of cloud computing which allows the manufacturing companies to provision and deprovision any of the cloud resources rapidly. While coming to the scalability, the cloud providers are planning for unlimited cloud and to provide any quantity at any time. Measured Service: The usage of cloud computing resources is measured as the customers have to pay the service for what they have used. The virtual server instances those are present in the cloud monitors, measured and reported by the cloud service provider. Azure Virtual Machines are one of the on-demand computing resources or virtual machines developed by Microsoft Azure. 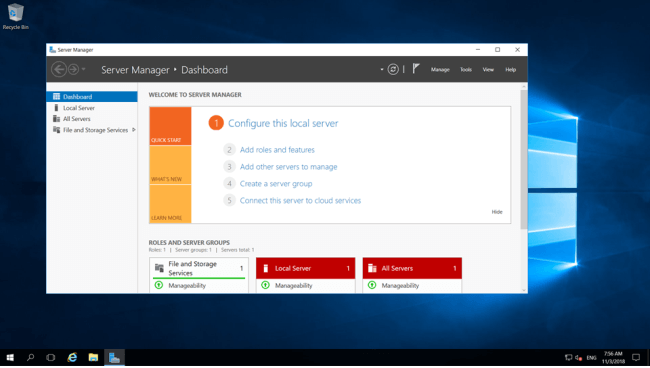 Azure VM is based on the Infrastructure as a Service through which the users can obtain more control over the environment to customize the hosting or development environment. Azure Virtual machines are a vital part of hardware virtualization. They are ready-made computer systems that are designed based on the virtualization concept. The concept behind the Azure virtual machine is similar to that of the cloud platform-virtualization. The major benefit of Azure VM is that the user can work on it and shut down it whenever they need. Azure Virtual Machine provides greater flexibility of virtualization without the usage and maintenance of physical hardware that activates it. However, you need to carry out tasks like configuring, patching and install the software that runs on it. With the help of Microsoft Azure Virtual Machine, you can able to create Linux Virtual Machines, SQL databases, application services, directory domain service, etc. In general, there are different types of Microsoft Azure Virtual Machines available. General Purpose: It has a balanced CPU to memory ratio which is suitable for testing and deployment of database ranging from small to medium. Compute-optimized: This type of Azure VMs has high CPU to memory ratio. It is the best option for medium traffic web servers, network equipment, and application servers. Memory Optimized: The memory optimized Azure VMs have high memory to CPU ratio. It is good for relational database servers, medium to large caches and for memory analytics. Storage Optimized: This type of VMs posses high disk throughput and IO ideal for data warehousing, NoSQL databases, SQL, Big Data, and big transactional databases. GPU: GPU is a specialized type of Azure Virtual Machines that are targeted for heavy graphics rendering and video editing purposes. They can also be used for modern training and differencing with deep learning. The user can avail either single or multiple GPUs. High-Performance compute: These types of Azure Virtual VMs are the fastest and powerful CPU virtual machines that come with high-throughput network interfaces (RDMA). In cloud computing, the workload denotes the amount of processing that the computer has given to do a certain task within the given time. The workload consists of a certain amount of application programs processing in the computer and some users are connected to and interacting with the computer’s applications. Usually, the workload of the Azure Virtual Machine is categorized into two categories. Azure Virtual Network (VNet) is the process of representing your own network in the cloud platform. Azure virtual networks allow different types of Azure resources like Azure Virtual Machine to communicate with each other, the internet and on-premises network with more security. Hence, it acts as an isolated and highly-secure environment to run your virtual machines and applications. Isolation: Each of the networks works independently you can classify them into segments while creating a virtual network. Isolation feature allows you to configure the virtual network to make use of the own DNA servers. Internet Communication: Whenever you launch any services or applications in the Virtual machine it is capable of accessing the internet by default to enable the inbound access to specific resources. Resource Communication: Resources that come under the Azure virtual network can communicate with each other with the support of private IP addresses regardless of the resources from various subnets. Virtual Network Connectivity: The virtual network can be connected to each other. The resources in any virtual network are capable of communicating with resources that are present in any other virtual network. Filtration of Traffic: The traffic filtration feature of the virtual network helps to filter the traffic from resources by using the IP address and port. 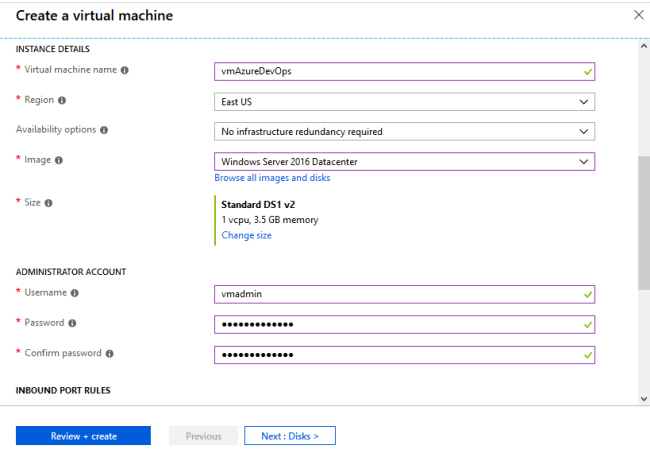 Are you decided to create Windows Virtual Machine on Azure Portal? Here are the step by step procedure to create them in a proper way. Before learning the creation of Windows Virtual Machine on Azure Portal you should have known about the prerequisites. First of all, you have to create the Microsoft Azure account to carry out the further process of installing virtual machines on the Azure portal. You must have an environment configured to support Windows or Linux VM creation. In addition to these, you have to meet up with the business requirements to create Azure Virtual Machine. 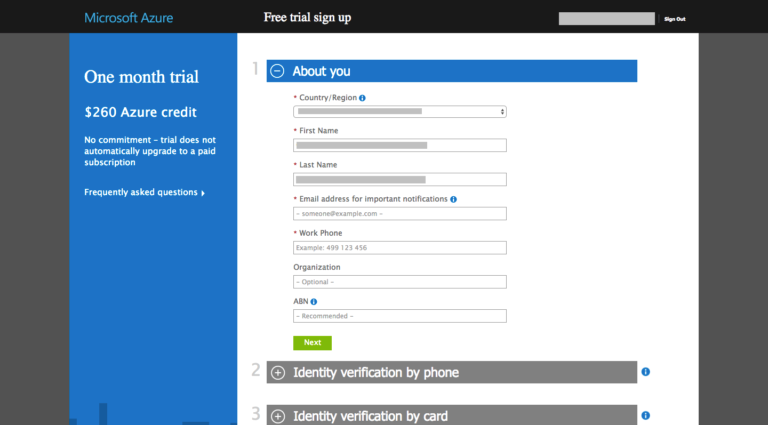 Step 1: Visit the Microsoft Azure website and click on ‘Start-Free’ option to start your trial. 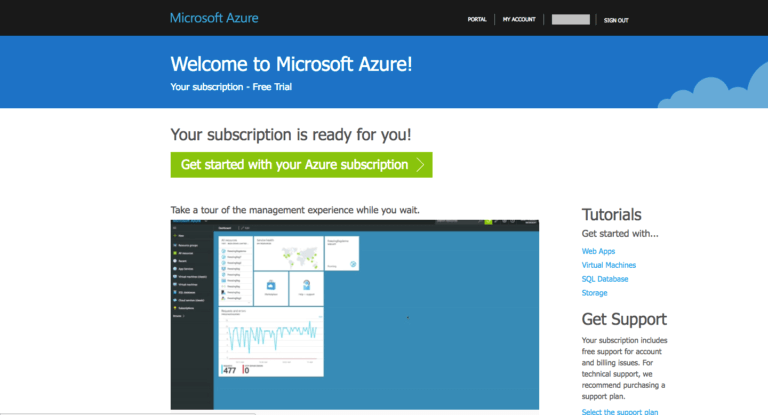 Otherwise, you can get the Microsoft Azure Subscription (MSDN Subscribers). View the below image for reference. 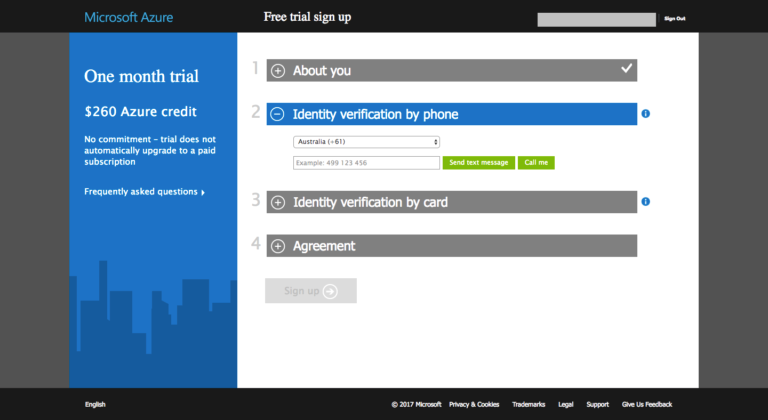 Step 2: Enter the Microsoft account credentials that are required in the page to log in. Step 3: When you log in, you can find certain details there and then follow prompts to verify your account through the phone. Step 4: Once you have received the notification you have to complete the further steps. Finally, make a tick on ‘I agree’ and click ‘Sign Up’. 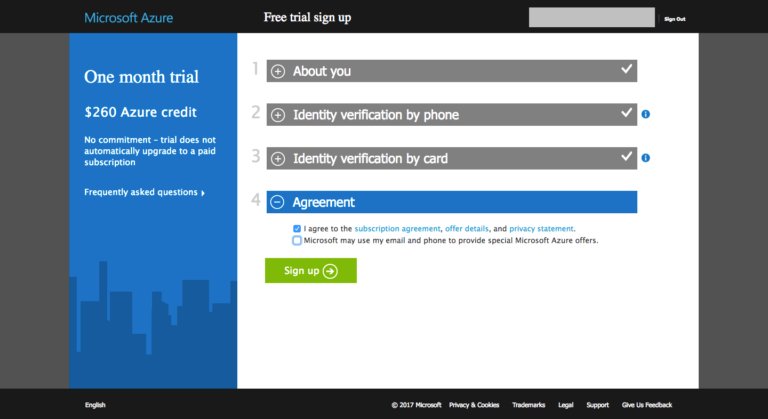 Now, your Microsoft Azure Account will be ready to use. To create the Windows Virtual Machine on Azure portal follow the steps below. 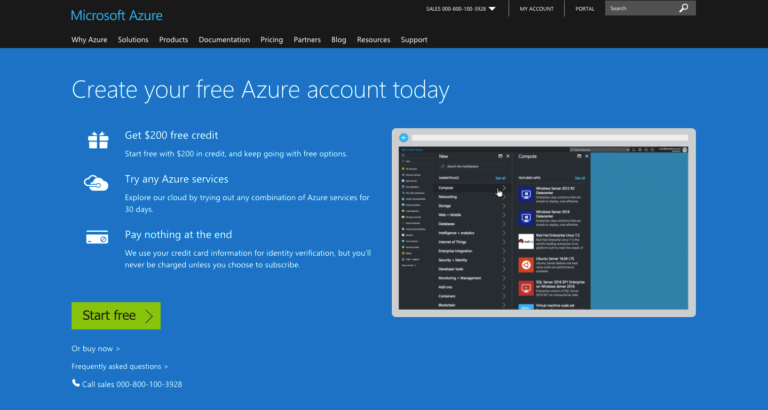 How to create an account in Windows Virtual Machine on the Azure Portal? Step 1: Select the virtual machine that is seen in the left menu panel as shown in the below image. Step 2: Enter the basic details such as Machine name, Resource Group, and the location where the server is hosted, etc. Step 3: Enter the Administrative details that you want to provide in your virtual machine. Administrative details are nothing but the username and password. Step 4: After the completion of step 3, you need to set up the inbound port rules. In case of public inbound ports, set as ‘allow selected ports’ and set HTTP, HTTPS, and RDP port. Then click on the ‘Next’ button. Step 5: In the disks tab, choose Standard HDD for the OS disk type and click on Next. Step 6: Click on ‘Create’ to check the validation process. When it works you can able to see the message as seen in the given image. If the machine is ready and running you can see the registered machine name in the list of the virtual machine. Step 7: Click on the ‘More Options’ and select the ‘Connect’ option to connect the Windows RDP. Step 8: Save the Remote Desktop connection file as .rdp to connect the virtual machine. Step 9: Now, open the respective file and enter the login credentials. Thus, this is the vital information that you need to know about Azure Virtual Machine. Hope that you all have understood that Azure Virtual machines are the right option to deploy the cloud based solutions. So, create the Azure virtual machines to face the challenges that may occur in the large infrastructure. Make use of this Azure Virtual Machine Tutorial to Get Well-Versed in Microsoft Azure and Reap Its Complete Benefits. 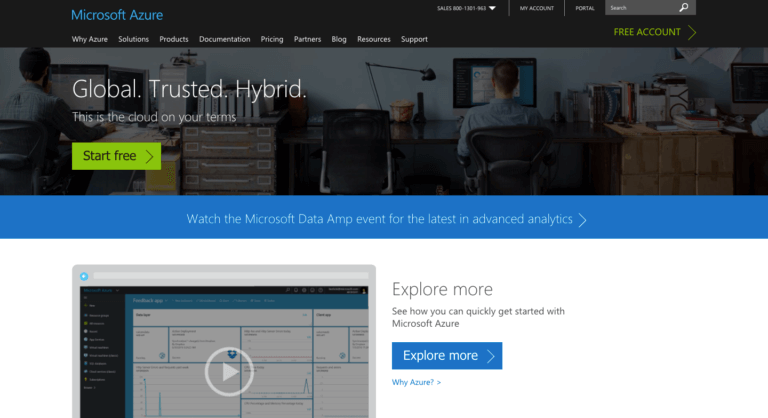 Explore Microsoft Azure Sample Resumes! Download & Edit, Get Noticed by Top Employers!Download Now!